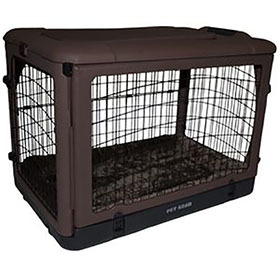 'The Other Door" Deluxe Steel Crate from Pet Gear features Heavy Duty Blow-Mold Plastic with steel inserts. Rounded corners mean no sharp edges. This eliminates damage to your home or car. Four doors offer incredible accessibility in any position.The garage style side door stays up and out of the way when open. Integrated wheels and pull handle make it easy to move from room to room. This dog crate combines ease of use with comfort and durability. You can't beat having four separate doors for easy entry or access to your dog. Plus, it folds flat for easy storage or transportation. The crate sets up in seconds and best of all, no tools are required. The crate has an attractive plastic shell in several colors, floor pan with steel wire sides and a plush matching bolster crate mat for your pup.